Only the Very Best will Do! 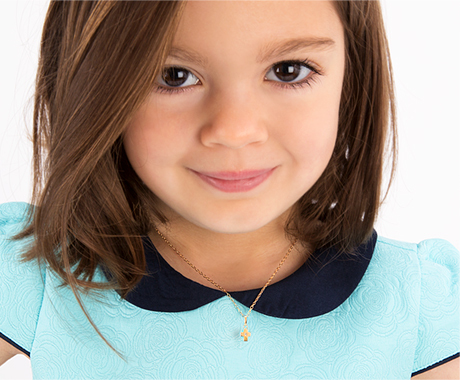 Although Quality is Paramount and Synonymous with Tiny Blessings Children's Jewelry, We Are Also Far and Away the Most Safety Conscious Children's Jewelry Manufacturer in the industry, going to great lengths to create and manufacture jewelry that is ultimately safe for children of all ages. Sterling Silver is the highest quality of silver available in terms of beauty and strength. Sterling Silver is 92.5% silver and 7.5% copper, the copper is added to give the silver strength, as silver by itself is too maleable and does not hold up well to wear. These pearls are simply stunning. You may option for "perfect round" pearls as an upgrade for about $5.00 each, but it is definately not neccessary. See our Pearl Educational Guide to really understand how great our pearls are. We buy direct from the pearl farm and buy the top 2% of quality of "perfect round" pearls, this tells you how rare natural perfect round pearls of AAA-Grade quality are. Originally, the farm was actually very confused by our requests to have the pearls drilled through, as these high-end pearls are almost exclusively used for rings and earrings due to the higher cost. Others create jewelry for children using A-Grade or even B-Grade potato-shaped pearls which lack luster, have inconsistent color, and show surface defects. These type of pearls can be bought for 1/20th the cost, or less! Just don't think because it states they use real pearls, that it means they are quality pearls! Quality pearls are graded AAA which means they have the very highest luster, illuminating and consistent coloring and flawless spherical shape. Swarovski® Advanced Crystal is 100% Child-Safe, Lead-Free, High-End Swarovski® Branded Crystal that we use in all our jewelry designs. You never need to worry about your child mouthing their jewelry, we go to great lengths to assure ALL of our components are 100% child-safe. Strong stainless steel cable in our bracelet designs to make sure your bracelet will not break easily. We are so confident in our quality cable, that we warranty our bracelets against breakage forever. Supplied along with each piece of jewelry sold by Tiny Blessings, we include a certificate of authenticity. Signed by the skilled jewelry artisan who created your jewelry, this certifies the quality of components that are used in your piece. The family who receives the gift will not mistake this for just any mass-produced jewelry, they will immediately recognize the quality and care that went into creating their custom, personalized piece just for them, whether it be their baby's first piece of jewelry, like a name bracelet, or a children's jewelry piece for an older child, or even a bracelet for mom. Our Free Gift Wrapping service is phenomenal. The gift wrapping is something really special - your item is placed inside a custom Tiny Blessings jewelry box, then wrapped with a luxurious white, double sided, real satin ribbon. This presentation is simply gorgeous, and if you want to see the item before giving it, you can simply slide the ribbon off to open the box, then slide the ribbon back on after your done looking at the item (very easy). We also include a Free Jewelry Polishing Cloth made of heavy duty microfiber fabric imbued with polishing agents to help keep your jewelry perfectly clean and shiny for all to admire. And, for storing your jewelry, we have included an Free Anti-Tarnish Drawstring Pouch, that when placed inside, your jewelry will be better protected against tarnish, dirt, and airborne impurities. * In our Mother's line of jewelry we use Swarovski® Crystal Pearls instead of real cultured pearls, although we do offer the real pearls as an upgrade. Find our high-end materials list here with references to other information found on tinyblessings.com that explain in more detail about the most important aspects of our jewelry.